Showing all blog entries tagged with "Update"
Things have been very quiet around here lately, so I thought I would update everyone on the status of Elevate Web Builder, ElevateDB, and DBISAM, as well as give more information on some general changes occuring here at Elevate Software. Elevate Web Builder 2.07 (more information here: Progress Update on Elevate Web Builder 2.07 has now become Elevate Web Builder 3, due to the sheer number of features being added. However, once Elevate Web Builder 3 is released, it will not be a major release upgrade and only require that you have an active Elevate Web Builder subscription (I will be blogging about the upcoming changes to our support policy in conjunction with subscriptions soon). Since switching to a subscription model several years ago, we have been avoiding doing any major releases due to the fact that our internal systems need some changes to accomodate major version upgrades being included with subscriptions. But, we have now fixed those issues and will be doing more major upgrades going forward. Work is progressing nicely on Elevate Web Builder 3 and is starting to hit the "downhill" phase of the project where things are rapidly coming together. Hopefully, it won't be much longer than the end of April or beginning of May when we can release a public beta. At this point, the quality of the beta looks like it may be more alpha than beta, but most of the rough edges will be missing features in the run-time for the server-side applications, and those features will be filled in pretty quickly during the beta. I apologize for all of the delays so far, but there have been several unforeseen issues that have extended the development time quite a bit. In particular, the IDE re-write took a few months and was not originally planned at all, but was necessary in order to get the IDE in a position to be able to support multi-mode (client and server) development. Large file support is now enabled by default in ElevateDB. Along with this change, the TEDBEngine LargeFileSupport and TEDBSession LocalLargeFileSupport properties have been removed. These are published properties, so please be sure to open, ignore any warnings about these properties being absent, and re-save any forms or data modules that use the TEDBEngine or TEDBSession components to ensure that you do not see any runtime component persistence errors in your application(s). The TEDBEngine ExclusiveFileAccess property has been removed and replaced with the TEDBEngine BufferedFileIO property. Please see the new features in 2.28 section below for more information on the new buffered file I/O functionality in ElevateDB. ElevateDB now includes new global buffered file I/O functionality. There are new TEDBEngine BufferedFileIO, BufferedFileIOSettings, and BufferedFileIOFlushInterval properties for configuring the buffered file I/O in the engine. Please see the Buffering and Caching topic in the SQL manual for more information. ElevateDB now includes new SQL statement and function/procedure caching functionality. There are new TEDBSession SQLStmtCacheSize and FuncProcCacheSize properties for configuring the caching, as well as the TEDBSession FreeCachedSQLStmts and FreeCachedFuncProcs methods for freeing cached SQL statements and functions/procedures. Please see the Buffering and Caching topic in the SQL manual for more information. There are two new system information tables, the FileIOStatistics table, and the SessionStatistics Table table. If your databases are particularly large and routinely contain table files that are in excess of 25-30GB of data, then the new buffered file I/O can improve performance by up to 10-20% over the existing model by allowing you to more accurately fine-tune the way that I/O is performed by ElevateDB and, consequently, the way that ElevateDB interacts with the operating system and disk hardware. If your application uses a lot of triggers and/or executes a lot of duplicate SQL statements, then the new SQL statement and function/procedure caching can improve performance by up to 30-40% by eliminating a lot of the overhead from SQL statement/function/procedure preparation. This is especially true with client applications that use session/statement pooling where SQL statements/functions/procedures cannot be manually prepared and cached by the client application for multiple executions. Going forward with ElevateDB, our main areas of effort will be in finishing the OS ports for Linux, Mac, Android, and iOS, as well as other lesser features like nested transactions and support for AES encryption. We are also still working on a single-file format for ElevateDB, and hope to have something available by the start of 2019. 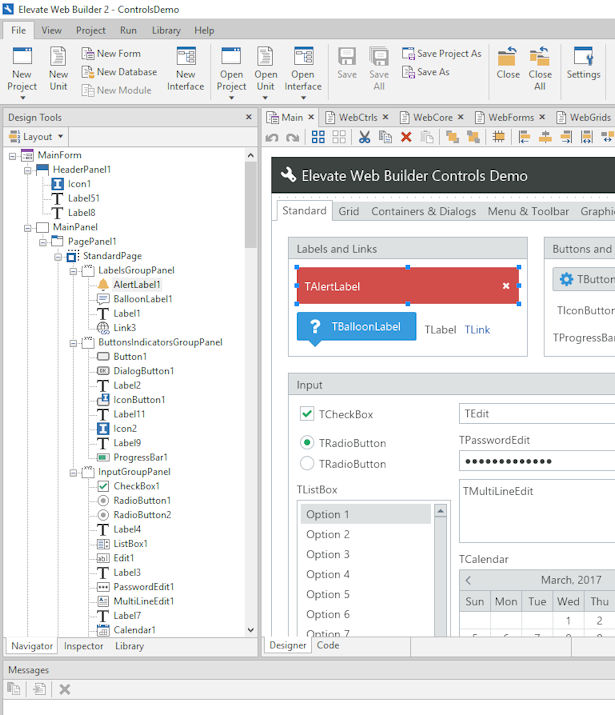 In addition, the ElevateDB Manager will be getting a facelift to match the UI of the Elevate Web Builder 3 IDE. DBISAM hasn't been getting much attention lately, and we will be rectifying this after Elevate Web Builder 3 is released. Later on in the year, we will be doing a thorough facelift on DBISAM to bring it up-to-date in terms of its UI, help management, and more. In terms of core improvements, our main goal is to get Unicode field support into the product and improve some core functionality, such as the socket handling, in order to bring it more in line with ElevateDB and Elevate Web Builder 3.